MANILA, Philippines – For the second straight conference, the PBA finals went into a do-or-die and a historic double overtime game seven match as Talk ‘N Text overthrew Rain Or Shine, 121-119 on Wednesday April 29 at the historic Smart Araneta Coliseum, in Cubao Quezon City. As expected, this series got too physical on and off the court. Even wives of players from both squads got involved into a verbal scuffle. 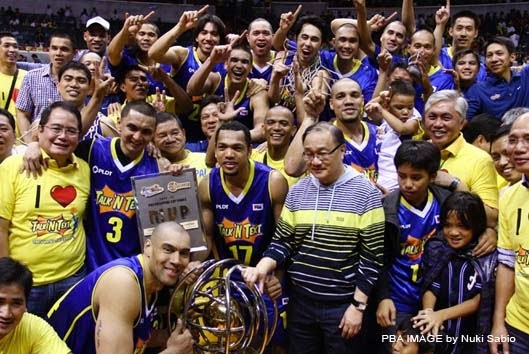 PBA fans were anticipating an “all-out war” and “no more tomorrow” game seven. In less than 30 seconds after the opening tip-off, Coach Jong Uichico’s boys engaged in an early 3-point shootout courtesy of Ranidel De Ocampo, Ivan Johnson and Jayson Castro. The Tropang Texters relied heavily on their outside and inside shootings to pose a 15-5 lead that prompted Coach Yeng Guiao to call for his first time out of the ball game at the 9:14 mark of the opening period. Larry Fonacier and Jay Washington joined the scoring party with their own rainbow arc shots. Paul Lee fired his own two three-pointers to catch-up with the surging Texters. But every time ROS scored, TNT fired back and maintained its comfortable lead in the entire first quarter, 29-21. Both crews adjusted their respective gameplays in the beginning of second quarter. Super tight defense was strictly enforced by both Head Coaches which limited the players to do the scoring in the foul lines. A fight almost erupted between Ranidel De Ocampo and Wayne Chism, when the Texter Forward intentionally extended his elbow on the Painters’ import during a fast break. De Ocampo was only charged with a regular foul that dismayed Coach Yeng Guiao who was consistently calling out the referees for a fair and square officiating since the playoffs started. Shootout continued after the two-minute warning between Ivan Johnson, Paul Lee and Ryan Arana. Rain Or Shine, however, missed the services of its top gunner Jeff Chan who remained quiet on the bench due to his foot injury. The Texters headed to dugout after 24 minutes of very intense basketball with an 8-point, 50-42 lead. Larry Fonacier rang the bell early in the third period and brought back his team’s double digit lead. But Jireh Ibanes immediately retaliated with a back-to-back baskets to stop the Texters’ momentum. Ranidel De Ocampo was feeling hot in the rainbow territory and sank two three-pointers and followed by another trey from the Best Player of the Conference, Jayson Castro. Ivan Johnson who had an off-night last game, tallied his 20th point midway in the penultimate quarter and dropped 30 in total. Aside from Jeff Chan, another player spent most of his game time on the bench due to another foot injury. Talk ‘N Text Rookie, Kevin Alas was forced to sit down after spending few minutes on the floor because of his hurting left foot which he sustained during game six. Paul Lee was doing his best in all sides of the floor with a hand from Christ Tiu to trim down the lead to just 7 points, 76-79 entering to the final 12 minutes of the do-or-die duel. Wayne Chism who was quiet in the first three quarters, sensed that he had to step on the gas pedal in order to bring the trophy home. Chism single-handedly carried his team on his should in the final quarter and successfully cut the lead to just 4 points. The game was obviously very physical as expected. But most of the contacts were unseen by the game officials but were clearly caught on camera just like Ranidel De Ocampo’s short jab to Jonathan Uyloan’s stomach that sent the “Super Sub” down on the floor. Chris Tiu hit a big trey on the 4:30 mark of the fourth and trimmed down the lead to just a half-shot. Jayson Castro immediately fired back with two three pointers and Paul Lee did the same thing. Wayne Chism bagged his first three pointer of the game in less than a minute after the three-point barrage of both squads. The Texters had a total of 20 threes while the Painters had 18 for an epic game seven shootout. Fans were on their feet after the final two-minute warning was called with the Texters up by 5 points. But all of a sudden, Wayne Chism drained a cold-blooded trey to cut the lead once again to just 2 points, 96-94 with just a minute remaining in the fourth canto. Ivan Johnson hit the deck hard off the rebound against his fellow import with 39 seconds left in the ball game. The game was stopped momentarily due to Johnson’s bloodied right elbow which he sustained from the hard fall. Johnson was given two foul shots and made only one for a nail-biting 3-point lead, 97-94 with 31 seconds more to be played in the fourth. Wayne Chism tied the ball game 97 all with a dagger three. Coach Jong Uichico immediately called a team re-assembly to talk things over and set-up a final play. Texters’ final play was to maximize and kill the time. Jayson Castro took his team’s last shot but missed and Chism secured the board and called a time out for the final push. Rain Or Shine inbounded the ball with 1.6 seconds left. Chris Tiu went for a catch and shoot but failed to make the buzzer beater. 48 minutes is not enough. The series extended for another 5 minutes of basketball. Talk ‘N Text won the opening tip-off but it was Rain Or Shine who scored first in the overtime and grabbed its first game seven lead. Ivan Johnson sank a two-pointer for the equalizer and Harvey Carey banked a shot to regain the lead, 101-99. Jericho Cruz found the open Wayne Chism on the right corner and hit another big time three followed by two foul shots due to a hack for 104-101 ROS lead. Ivan Johnson made a step back three-pointer in front of Jericho Cruz’s outstretched arms for the third dead-lock of the ball game. Coach Guiao called a time out with 19 seconds remaining and once again, score was tied at 106 all. Paul Lee took the last shot in the middle but missed it and left Talk ‘N Text with 1.6 seconds for their own version of catch and shoot. Jayson Castro took a contested shot but also missed. De Ocampo hit the first basket of the second overtime followed by a solid back-to-back treys for his 34th point of the ball game and his new career high. Ivan Johnson hit his two charities for a 118-113 lead with 24 seconds remaining. Jayson Castro gave his team a two-possession advantage by splitting his free throws 119-115. Paul Lee hit a quick three pointer for his 38th marker of the ball game to slash the lead to just 1 point. Larry Fonacier sank two foul shots for a 3-point lead. Castro fouled Paul Lee to eliminate the possibility of a 3-point shot and a tie. Lee, however, only made one of his two free throws and officially made the Talk ‘N Text Tropang Texters as the 2015 Commissioner’s Cup Champions. With his 34 big points and excellent performance in the entire series, Ranidel De Ocampo was awarded as the Finals MVP.